This beautiful journey through the Amazon invites readers to search their souls and follow Jesus wherever the river runs-experiencing the adventure of knowing the poor and forgotten people He loves. In Wherever the River Runs, Kelly Minter invites us on a jungle adventure down a river teeming with piranhas, caymans, a beautiful people, and, especially, God's presence. Her honest and engaging narrative pulls back the curtain on one of the most captivating places on earth as well as on parts of the gospel we may be able to recite but have never fully believed. For anyone feeling complacent in their American Christianity, Kelly's story of the forgotten people of the Amazon and how they transformed her understanding of the gospel, is sure to inspire. 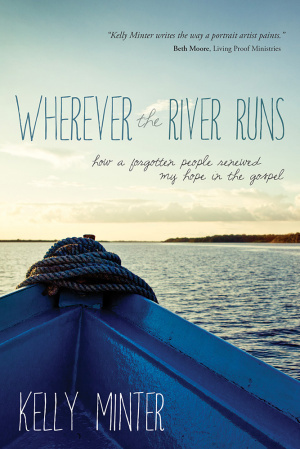 Wherever the River Runs by Kelly Minter was published by David C Cook in June 2014 and is our 2052nd best seller. The ISBN for Wherever the River Runs is 9781434707352. Be the first to review Wherever the River Runs! Got a question? No problem! Just click here to ask us about Wherever the River Runs.